Even though we just moved into a high-rise condo (which, incidentally does have the most fabulous rooftop pool – only bad thing is, we live underneath it so let’s pray that thing is sealed tight lol), when summer comes around I always get a little obsessed with outdoor living and swimming pool design. We live right downtown so there are tons of gorgeous homes on the river with the most fabulous landscaping and pool design, I’m definitely not above sticking my head over someone’s fence to check things out and get ideas. 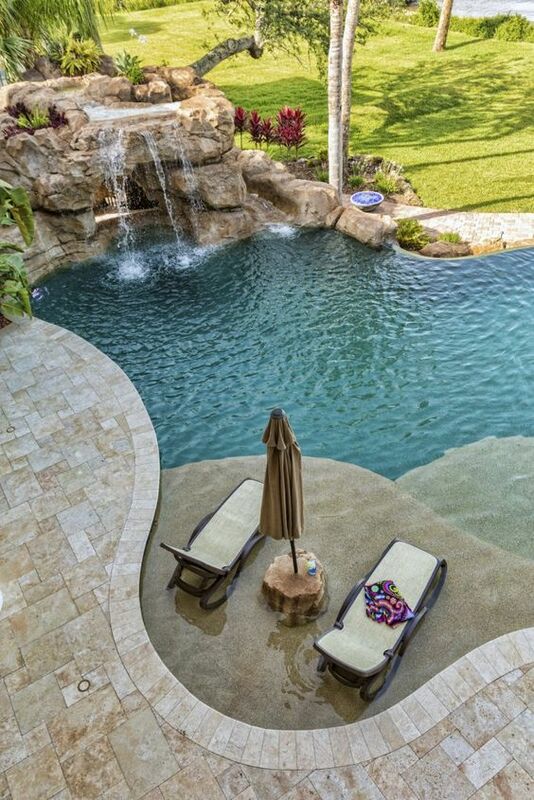 I see a ton of pools here in South Florida so I’ve become really picky, things like resurfacing pool deck and luxury patio furniture make all of the difference in the world! When I was growing up in the suburbs, virtually everyone had a plain white concrete pool deck with a traditional blue bottom pool, but in this day and age, there are so many other cool things you can do with your pool as well. For example, I’m a huge fan of black bottom pools. To me, they look so much more natural and blend in so much better with landscaping, they almost look more decorative which means that if you’re lucky enough to leave your pool cover off in the winter, it looks kind of like you have a beautiful pond rather than just a covered-over, unused swimming pool. Also gone are the traditional square pools, free-form pools are all the rage now too, once again, this is another touch that makes a pool look like a natural extension of your backyard. Some people even put a lazy river in their pools, this is not something I would do but hey if you have kids it probably takes care of all their outdoor entertainment needs all summer long! A waterfall addition can also help build into the existing landscape. The other key is your pool deck, I’ve gotten kind of obsessed with tile since we redid the floors in our condo, and interestingly, there are almost as many options for your pool deck as their are for your kitchen floor. There are all kinds of gorgeous rock, tile and granite options, once again, choosing a more natural material like slate for your pool deck helps it to blend in with the landscaping and look more natural year ’round. There’s always also the option of adding accessories like a built-in fireplace or fire pit that will encourage outdoor entertaining in the off months when it’s not warm enough to swim. Finally, don’t forget not to skimp on the deck furniture, this is something else that will allow you to enjoy your pool as many months of the year as the weather will allow!